From the breathtaking whitewashed buildings set against an azure sky on Greek Islands cruises to the spectacular, soaring glass and brass atrium on board Holland America Noordam, your vacation is a thrill for the senses. Jazz trios, string quartets, and disco create diverse listening opportunities as you travel around onboard, taking in the sights and sounds that make Holland America shine, while 5-star dining options abound. With room for just under 2000 guests, the Holland America Noordam travels to the Mediterranean and on southern Caribbean cruises as well. Her 21 day Seafarer cruises (or the shorter 10 day option) allow you to visit such ports as Barbados, Aruba, St. Thomas and Grand Turk. On board is millions of dollars’ worth of art with an iPod self-guided tour that you can indulge in to learn about your favorite pieces or the whole collection. For an intimate cooking lesson or a how-to on local cuisine, head to the Culinary Arts Center, or embrace the art of the crossword in the Explorations Café where you can work on a huge New York Times puzzle while taking in the scenery. Like all of the Holland America cruise ships, the Noordam offers staterooms much larger than on other lines, decorated with a tasteful palette of colours. Their suites offer whirlpool tubs and exquisite ocean views along with fresh fruit and access to their private, onboard club. For dining, the Holland America Noordam offers guests the choice of reserved seating or more casual on-your-own-time dining in the Vista dining room. Guests can also choose to eat at the Pinnacle Grill or the Lido restaurant. For relaxing, try the Piano Bar or the Crow’s Nest, a magnificent place to view the scenery by day and a fun nightclub by night. The Greenhouse Spa and the Thermal Suite offer guests state of the art facilities with full pampering, while the pools can be used in all weather thanks to the ingenious retractable roof system. There is also a hydro pool in a beautiful setting perfect for unwinding. The Holland America Noordam sails to the romantic Mediterranean and the sunny Caribbean on sailings throughout the year. For those Mediterranean cruise deals that showcase those lovely Greek Islands so perfectly– called Roman Empire Cruises– check online or with your favorite travel agent. 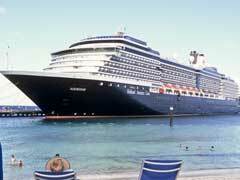 The lovely Noordam with her understated elegance and sophistication is the perfect partner on your dream vacation.